May 1, 2012 (Road Town, British Virgin Islands) – This month Grande Vegas Casino celebrates great female super heroes like Wonder Woman, Catwoman and even Super Mum. The Super Heroines leaderboard contest will award prizes up to $2500 and live raffles will surprise logged on players with instant prizes of $250. Grande Vegas players can compete against other players in the casino’s monthly and weekly leaderboards to win free bonuses totaling $10,000 in May. The month-long Super Heroine Challenge will award a top prize of $2500. 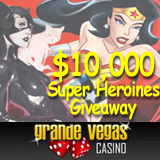 Super Heroines leaderboard contest details and players’ current standings are available at http://www.grandevegascasino.com/superheroines.aspx. Just by logging on during weekly live raffle periods, players are eligible to win instant prizes of $250. A deposit isn’t required either, but they do boost chances of winning. The live raffles will be held between 11am and 1pm EST on May 2nd, 9th, 16th, 23rd and 30th. Later this month, there will be a contest on the Grande Vegas Casino Facebook page and up to $1000 in deposit bonuses will be available during the Super Bonus Weekend.